On the heels of our Super Shower Blog, where we detailed some essentials for a grand shower, we've compiled a list of some increasingly common luxuries popular in upscale bath remodels. These comfort boosting "essentials" may just be the turning point for your bathroom, making it your favorite room and everyday routines "an experience worth looking forward to". Add a heated floor. Stepping onto warm tile in the morning is a great way to start your day. Tile can be warmed easily with an electrical wire system below the tile. It's well suited for a bathroom because ceramic is the best heat conductor of all flooring choices. Radiant electric heat in remodeling is generally used as supplemental heat, and comes with a programmable thermostat so that it can come on and warm up just before your alarm goes off. Radiant heating is preferred by many for its similar feeling to the sun. It provides more even heating in the room, reducing ”hot spots”" and varying room temperatures. It’s considered to be very energy-efficient because no heating is lost in transfer, as is the case with forced air heating where heat is lost as the air travels through ducts from the furnace to the various rooms in the house. 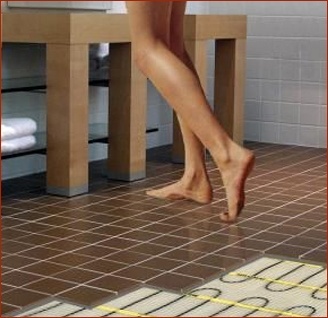 Because it is so efficient, using electric radiant heat flooring can help reduce energy usage. For the ultimate in luxury don't forget a heated towel rack as well. Attachable bidet seat, hands-free, high-tech marvels that you can install on your existing throne to gently wash and dry your private parts, are growing in popularity. An inviting heated seat can be adjusted to the temperature you prefer, with the washing and drying functions controlled by a wall mounted remote within easy reach. Watch out though, many clients report that once they have one they feel at a loss and annoyed when they need to do their business elsewhere. At your command, a washlet extends an integrated wand to release a "warm, soothing stream of aerated water to provide the ultimate in personal cleansing". These devices have remote-controlled retractable wands that spray well-aimed, warm, aerated water to clean you front and back. A dryer emits warm air, which reduces or eliminates the need for toilet paper, and a deodorizer abates any unpleasant odors. The lid even closes quietly when you're done, eliminating that annoying "toilet lid slam". Toto is the most well known. Kohler's version has an added lighted bowl feature to guide you in the dark, and separate wands for front and back. The newest Toto units, the S300e and S350e, can store settings for two people and feature the "e-water+" system, which pre-mists the toilet bowl surface with electrolyzed water. This aids in the elimination of waste. Toto reports that the e-water+ system works 80% better than a dry bowl. Sound interesting? 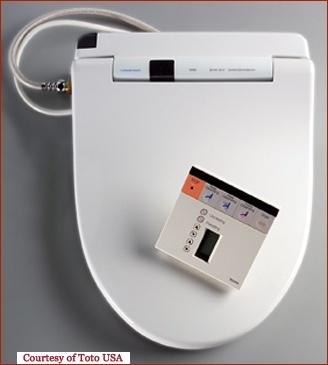 We have an operating Toto S300 washlet in our showroom bathroom that you can try out. Come on down! Bathrooms are small spaces and every inch matters. One spot where you spend a lot of time is at the sink. If your master bath has just one, get another, if you have extra counter space. No need to take a number and wait in line; dual sinks allow you both to complete morning maintenance tasks simultaneously without tripping over one other. Add a wall tower with outlets inside, where the hairdryer can stay plugged in, and where bottles of product are readily available. Lotions, etc. can stand up right without cluttering your counter. Rather than mirrors, consider medicine cabinets with soft side lighting, that makes you look and feel good while you get ready for your day. Side lighting produces less shadows on your face than lighting from above. Robern has minimalist designs that have clean lines and innovative technology. Their M Series cabinets offer sophisticated functions such as an electric charging station, defogger, night light, cold storage and integrated TV. The TV is integrated in lower corner and enables unobstructed mirror use while watching the morning headlines. 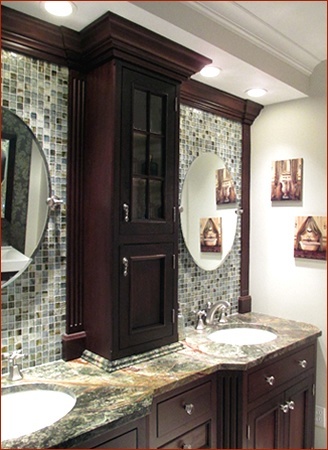 Today's vanities offer more functionality than those of days gone by. 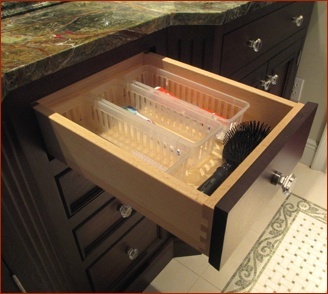 We like to include at least one bank of drawers at each vanity station, or one centered between two sink bases. Full extension glides allow access to the full depth of the drawers, making retrieval of daily necessities easier. When counter space is limited and a central sink is shared, it's nice to each have a bank of drawers on "your side". Consider the human factors of your vanity work stations when remodeling. Plan well, making sure that your bathroom design creates efficient zones that work for you, rather than you working hard at them as your struggle through your morning routine. Bathrooms by their very nature are moist places. When this moisture builds up, the small room can become stuffy and mold can grow. There are a lot of cool products out there that can minimize these problems. 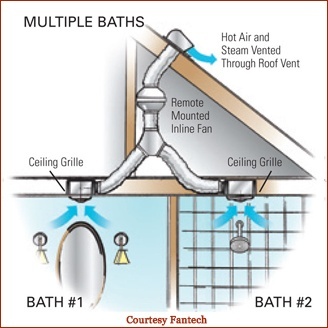 There are quieter automatic sensing fans and "remote fans" that can ventilate multiple baths with the fan itself mounted somewhere other than right above your head in the bathroom. At the very least, even if you don't have a jazzy fan, make sure your fan has enough "oomph" and that it vents to the outside. Home Ventilating Institute (HVI) provides minimum guidelines for how much ventilation you should have. They recommend a minimum of 1 cfm per sq ft, up to 100 sq ft of floor area. For larger baths, it's a minimum of 50cfm for each toilet, shower or tub, and 100 cfm for a jetted tub. Get a timer because HVI recommends that you leave the fan on for 20 minutes after you shower, and this is easy to do if you just have to press the 20 minute button on a timer. 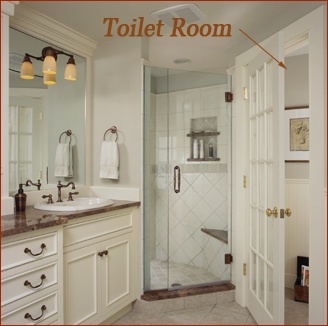 For oversized baths, spot ventilation at the source is one way to ensure proper ventilation. Small ceiling grilles (with or without lights) can be easily positioned directly over showers, whirlpool tubs, steam showers, toilet or vanity with the fan motor installed away from the living area (like up in your attic) for super quiet operation. We like Fantech 's Premium Bath fans, which were developed specifically to ventilate multiple areas of the bath with one remotely mounted motor. Another alternative is a centrally located fan. The air will then be pulled through the entire room and exhausted at this location. There are fans that detect humidity and motion and turn themselves on and off appropriately. Broan UltraSense™ fans detect both humidity or motion. Their single-speed models turn the fans on automatically. These fans are quiet. A typical "old" fan was rated at about 4.0 sones, Broan has models that are less than 0.3 sones. For reference, four sones is how loud a tv is, and .5 sones equates to the sound of rustling leaves. Broan also has multi-speed models that run continuously at a lower CFM level, and then automatically turn the fan speed up when necessary. As current construction techniques "tighten up" our houses, it takes air contaminants longer to dissipate on their own. Powered ventilation throughout the home is becoming more essential, and an element such as an "always on" fan helps with this. It's worthwhile to make provisions to remove moisture from your bathrooms and prevent the development of oppressive humidity, especially when there are so many good fans out there that are quiet and do the job well. It's an investment that will pay back in your quality of life, as well as the longevity of your bathroom. In modern bathroom remodels, modesty often reigns supreme with owners electing to create a separate toilet room to house the commode. These rooms allow for nice blend of multi-person bathroom use and privacy. Although solid walls can make the overall room feel smaller, having a window in the toilet room make a huge difference. Rather than using a solid wood door, consider a full lite glass door, perhaps frosted, which balances the sense of privacy while minimizing that claustrophobic feeling that a "toilet room" can create. Another alternative is a pocket door that is left open when the bathroom is just being used by one person. Other ways to enhance privacy and comfort include placing the toilet out of the direct line of sight--off to one side of the doorway or protected by a vanity. Blocking it off with a half high knee wall or a built in book case can make a big different in how the various areas of the room feel. Privacy glass panels can be made with custom sandblasted designs that provide a visual barrier without blocking light. These can be floor to ceiling, and take up little floor space, and add a focal point to the room. Depending on the size of your space, a toilet room may work for you, or it may not. But it is important to give some consideration to your privacy desires, particularly in a multiple person bathroom. A warm toilet seat, a heated floor, and a great vanity work station are upgrades that can make your bathroom a great place to start your day. 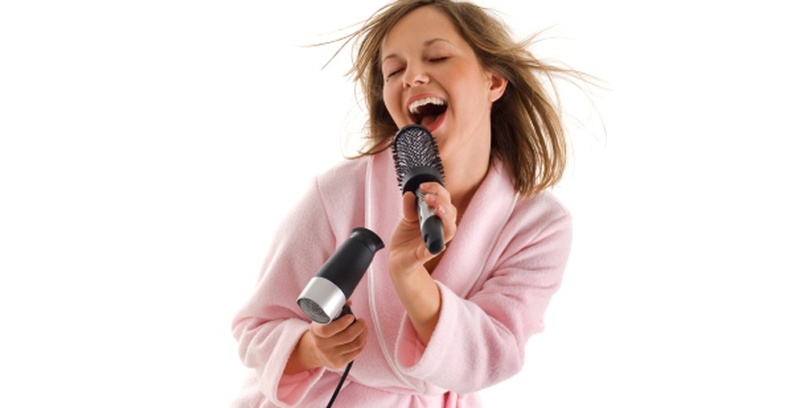 Be careful that you don't like it so much that you are so busy singing and enjoying yourself that you are late for work or dropping the kids off at school.